Rocksmith 2014 Edition is compatible with the original Rocksmith Real Tone Cable that plugs any real guitar directly into a PC or Mac. © 2013 Ubisoft Entertainment. All Rights Reserved. 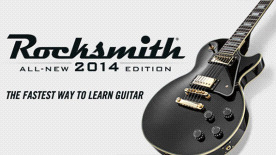 Rocksmith logo, Ubisoft, and the Ubisoft logo are trademarks of Ubisoft Entertainment in the US and/or other countries. “PlayStation” is a registered trademark of Sony Computer Entertainment Inc. Windows, Xbox, Xbox 360, Xbox LIVE, and the Xbox logos are trademarks of the Microsoft group of companies and are used under license from Microsoft.